Finally Amazon managed to deliver my copy of Ryan Bolger and Eddie Gibbs book "Emerging Churches: Creating Christian Communities in Postmodern Cultures" ... OK, so I'm behind the pack here, but... reading it this morning while the hairdresser went mad with my hair (just 5 colours this time). I'm only a third of the way through but already there have been some "YES!" moments... the first one is simply the way they have put the book together! One of the thing that winds me up about the EC conversation is that people are always looking for a Leader and a Label... I guess this makes the argument easy... "Oh so and so, your leader said this..." but this book makes it clear that you just can't do that with the "Emerging Church" conversation. Ryan and Eddie have interviewed a large number of pioneers from across the globe and what 'emerges' is not a top down structure but a 'swarm' of entrepreneurs busy learning and adapting to their history, their cultures and their God! There is a spectrum here, many colours, one rainbow! Good thing is I don't agree with everyone all the time... but I understand their journeys and I feel a connection with all of them. Wonderful guys, thanks! Second, moment is when they begin to explore 'Deconstruction'... not a revolution, but a rethink! not a 'volt face', but an evolution... welcome to the reformation! Third, they are already identifying what for me are key elements of 'EC' ... that it is a 'quest for a holistic spirituality' - Sensory and Thinking, Individual and Social, Active and Contemplative, Ancient and Future, Creative and Participatory, Inclusive and Missional! One source of great on-line spirituality resources is Embody (Bruce Stanley, one of the guys behind ReJesus amongst other things) He has this great little flash on Dreams ... I have been thinking about dreams quite a bit recently for several reasons! Thanks to Bob for this link... He suggested it as a distribution idea... will think about that, it all seems rather 'professional' for an amateur like me! Either way it is a great resource site The Work Of The People - which by the way is what the word 'Liturgy' means. Dan Browns 'Da Vinci Code'... or is it? Not only is Dan Brown a terrible writer, whose books all share the same plot, but now his most famous 'novel' is being challenged in the High Court! Richard Leigh and Michael Baigent are accusing Brown of plagiarising their 1980's book 'The Holy Blood and the Holy Grail'. They claim that 'huge chunks' of 'The Da Vinci Code' have been lifted from theirs and that the whole 'architecture' of Browns book is dependant on 'The Holy Blood and the Holy Grail'... Ok, so if you like I have read both books (in fact I have read all of Brown's books) then Browns massive debt to Leigh and Baignet is a no-brainer... indeed he name checks their book in his... but is it plagiarism? They seem to say that because the plot would have no coherence at all (if it has any anyway!) without their writing all Brown has done is to take their work and add a few (pretty thin) characters! Personally, I think he should be charged with crimes again literature never mind plagiarism! And before you call me a snob, I love 'pulp'/adventure fiction e.g. Bernard Cornwell even early early (before he became a mouthpiece for right wing 'Republican' politics) Tom Clancy! 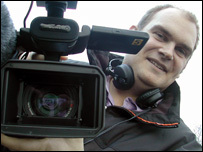 BBC Shropshire TV Faith Producer Andrew Horton made three short films asking the question "what would it be like to meet...". He asked three people who are followers of Christianity/Islam/Buddhism to wonder how they would react/respond to meeting Jesus/Mohammed/Gautama Buddha ... I was fortunate enough to be asked to do my bit... here is a link to the series... Face 2 Faith. Jesus gets stuck in a bunker! 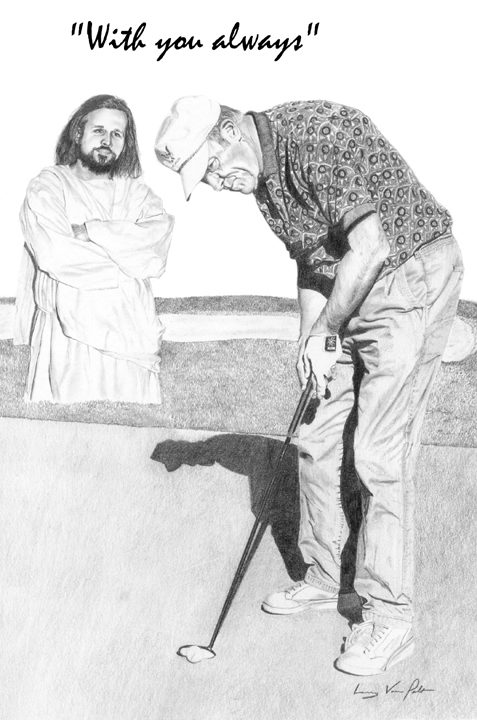 Jesus could walk on water, so the Bible tells us... so just what is going on in this bunker??? Thanks to Jonny and Ben for the momentous news that Massive Attack not only have a new Album due out soon but the first single is a collaboration with the great Terry Callier! I commented on Jonny's blog that lying on my back in 'Centaur' with waves of chilled out jazz drifting across the room at Greenbelt was not only one of my top ten Greenbelt moments, but one of my top ten Music moments!... dream like experience! 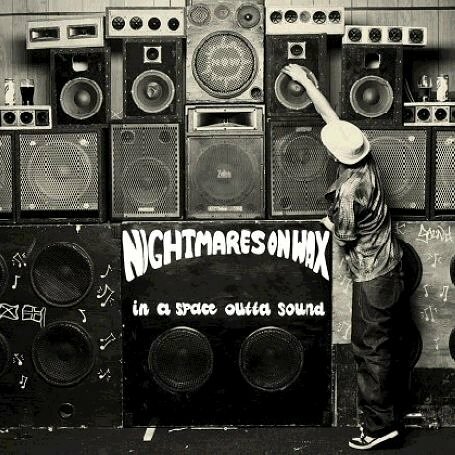 Anyway... whilst checking out the iTunes link (the single is not available till March) I found (sorry if you know this already) a link to download videos... specifically in this case the incredible Video for Massive Attack's 'Teardrop' ... you may remember the video - the one with the unborn baby. Don't be surprised to see it used in a meditation... soon! It's Lou's birthday today (my long-suffering (14 years!) wife!) she is away at her Parents so won't be reading this... but Happy Birthday anyway. 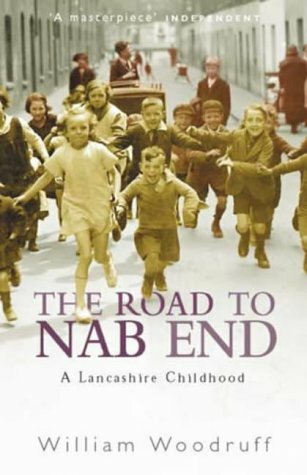 On a less than happy but still celebratory note, it is the anniversary of the death of Lowry. 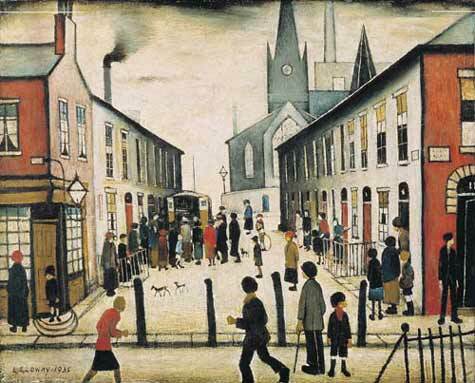 I have always loved Lowry's work... he really captured the spirit of the industrial north. My (Dad's) Family is from the North West so although that culture had died out before I was born, there is a resonance for me. My Grandad spent some years working in the Mines and my Dad grew up around the mills of Preston. For a literary equivalent try the books of William Woodruff.